St. Menas is considered the most well know saint in the East and the West, due to the many miracles that are performed through his prayers for us. That is evident in the numerous little clay bottles (ampullae) on which his name and picture are engraved. These were discovered by the archeologists in diverse countries around the world, such as Heidleburg in Germany, Milan in Italy, Dalmata in Yugoslavia, Marceille in France, Dengela in Sudan, and Jerusalem. These pottery ampullae (small holy-water flasks brought from pilgrimage places as a souvenir, and mass-produced in Early Byzantine times) come from Abu Mena, near Alexandria in Egypt. They were intended to receive the oil of the lamps suspended above the saint's tomb or holy water (eulogy) of the sanctuary of Abu Mena, and were kept piously by the pilgrims. A typical ampulla has an oval body and short cylindrical neck and two handles. Both sides show the same subject: St Menas wearing a tunic and cloak, flanked by two camels. On either side of his head can be read the Greek inscription O AGIOS MENAS (O AGIOS MENAS) (St Menas). The cult of St Menas, an Egyptian soldier in the Roman army, martyred because he refused to recant his Christian faith, was centred on Abu Mena near Alexandria. There was a healing spring, and pilgrims visiting the spring would take away sanctified water or oil from a lamp suspended in front of St Menas' tomb. 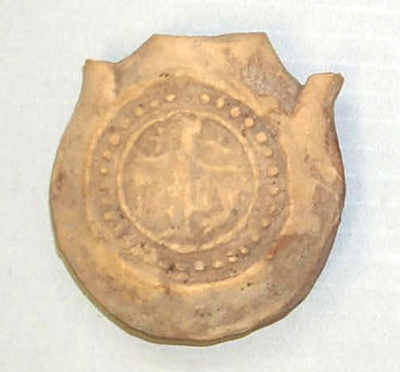 Pilgrim flasks like those depicted below have been dated from the late 4th to the 7th centuries. Pilgrims believed (and still believe) that St. Menas could continue to work miracles even after they had returned home. Today, pilgrims to the New Monastery of St. Mina in Mariut receive (free of charge) St. Mina's Holy Oil in very simple plastic ampullae (cylinders) to carry back home. 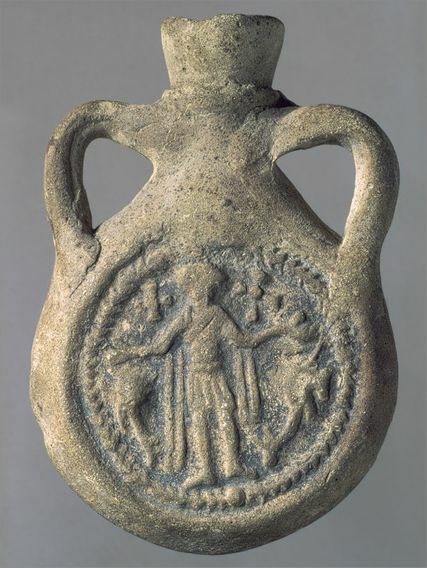 Eulogy ampulla of Saint Mena. Coptic art, Egypt (6th century A.D.) (Städtiche Galerie Liebighaus, Frankfurt. Terracotta E 24445). 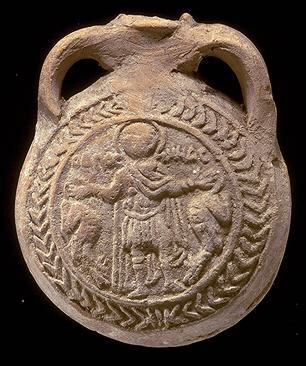 A pilgrim flask depicting St. Menas standing between two camels. These were used to carry oil back from his shrine at Abu Mina, Egypt, c.6th century AD, and have been found at many sites scattered throughout Europe from as far away as Gaul. 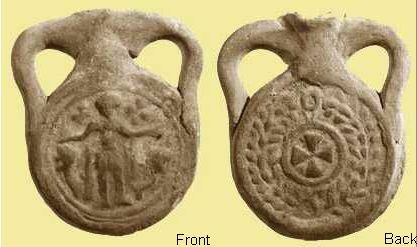 Pilgrims flask depicting St. Menas as an orant, flanked by two stylized kneeling camels. The reverse side contains the Blessing of St. Menas inscription within a wreath. Twin handles surround the center spout. These flasks were used to carry oil back from the shrine of the saint at Abu Mena, Egypt. 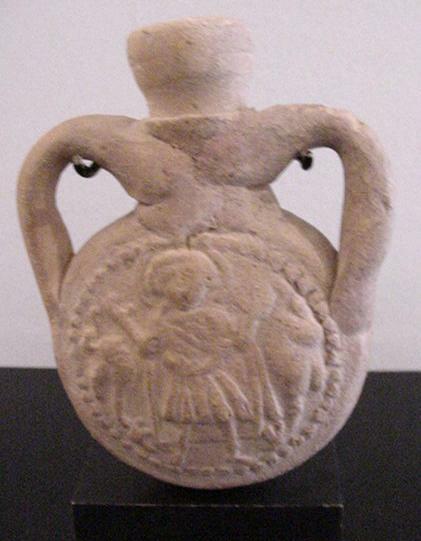 A similar flask may be found at the Louvre in Paris, France (see photo below). Front and back of flask with sharp images; one handle and part of neck restored, one handle original. 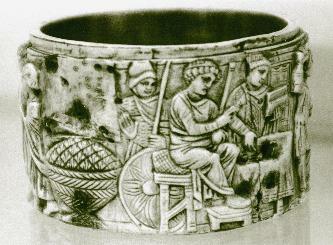 Ca 6th century A.D. - 4" (10.1 cm. high). Another pilgrim flask from Abu Mina, now at the Louvre, Paris. 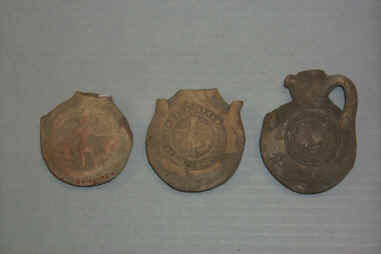 The collection of Staten Island Institute of Arts and Sciences at the College of Staten Island Library contains three pilgrim-flasks or ampullae from Abu Mena's shrine. On the two best preserved flasks, St. Menas is depicted as a standing orant figure, nimbed and dressed in a chlamys and tunic. The saint stands between the two kneeling camels that carried his body to Abu Mena. On either side of the saint's head is the Greek inscription `St. Menas.' Pilgrims used these flasks to contain oil from the lamp suspended above the saint's tomb, or to fill with water from a miraculous spring. Some flasks bear Greek inscriptions proclaiming the miraculous qualities of these liquids: 'We recieve the blessing (eulogia) of St. Menas'. By means of these flasks and their hallowed contents, pilgrims from the Mediterranean world believed that St. Menas could continue to work miracles even after they had returned home. Ampullae like this were used by pilgrims to carry water or oil home from the great pilgrimage site for Saint Menas, said to be a late third-century Egyptian Roman soldier who was martyred for his Christian faith. He is shown between the two camels that returned his body for burial. 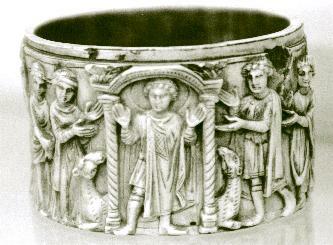 Small resin cylindrical pyxis lacking base and lid, illustrating scenes from the martyrdom of Saint Menas. Height 12.4 cm, diameter 12 cm. Provenance: Original of ivory, probably from Alexandria. Pyxis, or ivory box, perhaps used to hold incense, or relics. The pyxis has lost its cover and base, lock and hinge. It features scenes from the tragic martyrdom of the fourth century Egyptian saint, Menas. St. Menas was an Egyptian camel driver (?) who joined the Roman army and was martyred under the emperor Diocletian around A.D. 303. The series begins with a prefect seated on a stool flanked by a guard and a scribe; then follows Menas' execution--the executioner grabs the saint by the hair and raises his sword; an angel appears on Menas' left to receive his soul after death; Menas is then depicted as orant (a stock figure of the martyr) with halo, lifting his hands and eyes heavenward, declaring his faith while pilgrims approach; he stands under an arch, representing his sanctuary; two supporting columns are flanked by camels.